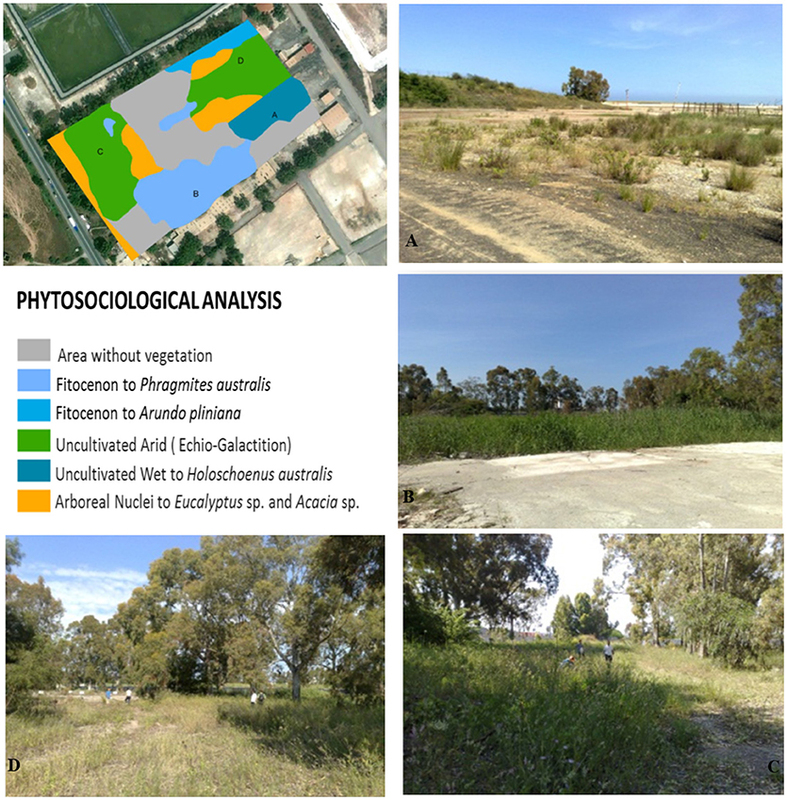 We applied an integrated phytoremediation system by inoculation of rhizosphere microbes on an area of 2,000 m2 that was contaminated by heavy metals. Hybrid poplar (Populus deltoids × Populus nigra) and willow (Salix purpurea subsp. lambertiana) were planted on four parcels of 500 m2. Of these, two parcels were inoculated with an autochthonous consortium specially selected and the other two were not inoculated. The analyses were carried out on plant and soil samples collected at different times: month 0 (T0), 12 (T1), 24 (T2), and 36 (Tf). Total concentrations of HMs in the roots of Populus and Salix showed significant increase in the plants with rhizosphere microflora consortium. The plants treated with the consortium have an increased enzymatic activity of antioxidants and of stress markers. All enzymes showed an important contribution in enzymatic thiol-dependent ROS scavening mechanisms, through its over-expression at time T1 and T2 and a consequent stabilization at Tf which results in adaptive mechanisms. The plant-fungi-bacterium system was a valid candidate for the implementation of phytoremediation systems in the field, since the plants showed a greater capacity for adaptation and accumulation. - The plant-fungi-bacterium system was a valid candidate for the implementation of phytoremediation systems in the field. - Hybrid poplar (Populus deltoids × Populus nigra) and willow (Salix purpurea subsp. lambertiana) were planted on four areas. - Total concentrations of HMs in the roots of Populus and Salix show significant increase in the plants with rhizosphere microflora consortium with a high value of (TF) for Zn and Pb. Phytoremediation is a promising technology, inexpensive, with a low impact, and is well-accepted by the population. It is based on the capacity of the plant to eliminate pollutants from the ground or make them non-harmful. The capacity of the plant to adsorb and accumulate Heavy Metals (HMs) in different organs represents a technological opportunity of sure interest in application (Wu et al., 2010). The accumulation of HMs in plants depends on a numerous factors, first the bioavailability of these in the soil and the consequent physiological processes in plants (e.g., plant growth, exposure period and heavy metal concentration in soil, soil pH). One of the bases of phytoremediation technologies is the search for species that have a wide tolerance to HMs, show storage capacity and have a high biomass. These characteristics related to the conditions of the site where the reclamation is to be performed, guide us to the most convenient, and efficient choice of plant possible. The Salicaceae is known both for its high tolerance and for its metal absorption capacity, as it produces a high volume of easily harvestable leaf biomass and develops a massive root system in the topsoil (Cocozza et al., 2014). Many studies show the ability of different clones of poplar and willow to add high levels of HMs in the different tissues that make them among the most promising species for phytoremediation in the field (Gaudet et al., 2011; Chen et al., 2014; Redovniković et al., 2017). The positive performance of phytoremediation can be implemented through the addition of biological agents that in different ways contribute to the success of phytoremediation. Lately, the choice of used selected microbes has reached importance for phytoremediation of metal contaminated soils (Ma et al., 2016). Many studies have shown that the addition of plant growth promoting rhizobacteria (PGPR) induces a lower plant phytotoxicity, helps the plant have a better homeostatic regulation, develops greater biomass, and shows a higher HMs accumulation performance (Glick, 2010). Some studies show that several endophytic bacteria associated with Salicaceae plants increase the up-take capacity of HMs in plants and show their greater capacity for growth (Dai et al., 2012; Baldantoni et al., 2014). We experimented on a soil contaminated by Metals (Cd, Pb, and Zn) and metalloids (As), in full scale and for 3 years, a combined process of phytoremediation using two species of Salicaceae (hybrid poplar Populus deltoids × Populus nigra and willow Salix purpurea subsp. lambertiana) with and without the addition of a selected consortium by bacteria and fungi. Hybrid poplar and willow were monitored through the biometric parameters, the analysis of antioxidant enzymes for homeostatic regulation (Superoxide dismutase, Catalase, Ascorbate peroxidase, Guaiacol peroxidase) and the metabolic activity of enzymes that play a key role in abiotic stresses (Glutathione S-Transferase, Phenylalanine Ammonia Lyase, Proline content, and Lipid peroxidation) and the uptake of HMs. This study was conducted in the Site of National Interest (SIN) named “Crotone–Cassano–Cerchiara” in Southern Italy (Figure 1). The area extended for about 50 ha. divided into different industrial sectors. HMs (mainly Arsenic, Cadmium, Lead, and Zinc) contaminated the sector involved in our experimentation in the top soil (0–1 m) [see Table 3 in (Marchiol et al., 2013)]. The mean levels of As, Cd, Pb, and Zn in soil were always much higher than the permissible Italian threshold values for industrial soils. The experimentation was conducted on four areas (A, B, C, and D) of 500 m2 each for a total of 2000 m2. The experimental design was provided for application in all areas of optimal agronomic practices (landfarming and fertilization) and carefully chosen woody plant species (phytoremediation), while only in areas B and D selected rhizosphere microorganisms (mycorrhizae and PGPR) were inoculated to safeguard both plant growth and promote tolerance to pollution. The four areas were executed by landfarming to a depth of up to 1.20 m and were led by a mineral fertilization composed by Nitrogen (100 kg ha−1), of Phosphorus (80 kg ha−1) and Potassium (80 kg ha−1). An automatic drip irrigation system was used. 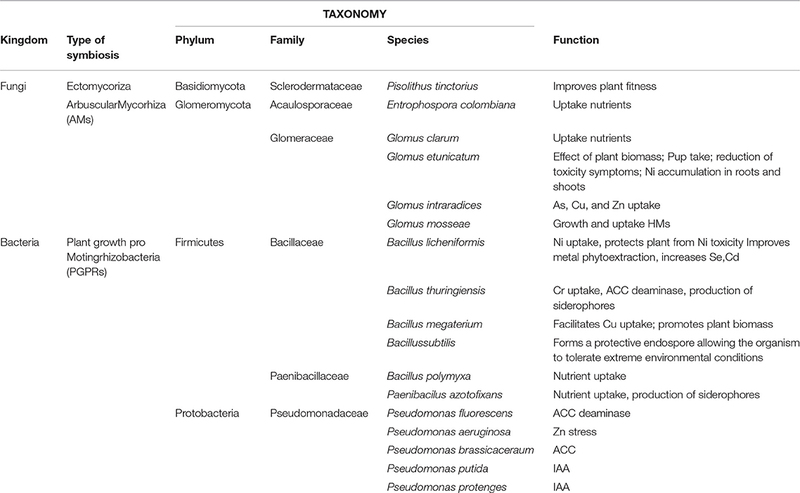 In the areas B and D the bioaugumentation was provided by using a selected rhizosphere microorganism's consortia consisted of bacteria and fungi both indigenous [see Table 3 in (Guarino et al., 2014)] and from scientific literature. Pisolithus tinctorius was the fungal ectomycorrhizal used and fungal endomycorrhizae were Entrophospora colombiana, Glomus clarum, Glomus etunicatum, Glomus mosseae, Glomus intraradices. The beneficial bacteria used were Bacillus licheniformis, Bacillus megaterium, Bacillus polymyxa, Bacillus subtilis, Bacillus thuringiensis, Pseudomonas fluorescens, Pseudomonas aeruginosa, Pseudomonas brassicacearum, Pseudomonas putida, and Pseudomonas protegens. This consortium was additional (15 g per plant) in the rhizosphere soil. Hybrid poplar (Populus deltoids × Populus nigra) (areas A and B) and willow Salix purpurea subsp. lambertiana (areas C and D) were selected for phytoremediation based on the ability of Salicaceae in uptake of HMs, which is very evident in scientific literature, and their aptitude to rapidly produce a high quantity of biomass (Table 1). Five hundred hybrid poplar of Populus deltoides × Populus nigra (250 for each area) were planted in a regular order in the areas A and B; while, five hundred willow of Salix purpurea subsp. lambertiana (Clone LE01) (250 for each area) in the areas C and D.
Figure 1. The phytosociologiacal analysis of the SIN (Site of National Interest) named “Crotone-Casssano-Cerchiara” of south Italy. (A) Uncultivated arid, (B) Fitocenon to Phragmites australis, (C) Fitocenon to, (D) Arboreal Nuclei to Eucalyptus sp.and Acacia sp. Table 1. The rhizosphere microflora consortium used. The environmental matrices (plants and soil) were sampled at different periods: month 0 (pretrial-Control, May 2013, T0), 12(May 2014, T1), 24 (May 2015, T2), 36 (May 2016, Tf), and three biological replicates were analyzed. 10 g of soil samples from polluted areas were collected in sterile bags containing 90 mL of sterilized peptone water and ground with a mechanical homogenizer. Isolates were distinguished to species level by amplifying 16S (bacterial) and 18S rRNA (fungal) with PCR (Guarino et al., 2014). Soil samples from each areas (0–50 cm depth) were collected and stored in labeled polypropylene containers, and kept at 4°C for further treatment and analysis. In according to the USEPA method (USEPA, 1995a,b) total content of Arsenic, Cadmium, Lead, and Zinc in soils extracts were measured by an ICP-OES (Guarino and Sciarrillo, 2017). Thirty fresh leaves (250 g) of poplar and willow were homogenized under liquid nitrogen into a fine powder and were centrifuged at 19,000 g for 30 min at 4°C. The activity of stress marker (Glutathione S-Transferase, Phenylalanine Ammonia Lyase, Proline content, and Lipid peroxidation) were evaluate as described by (Guarino and Sciarrillo, 2017). The antioxidant enzyme activity (Superoxide dismutase, Catalase, Ascorbate peroxidase, Guaiacol peroxidase) were determined as follows. Superoxide dismutase (SOD) activity was expressed as unit mg−1protein (Beauchamp and Fridovich, 1971). Catalase (CAT) activity was tested spectrophotometrically and was measured as nmol of H2O2 mg−1protein min−1 (Aebi, 1984). Ascorbate peroxidase (APX) activity was tested as mmol of ascorbate mg−1protein min−1 (Nakano and Asada, 1981). Guaiacol peroxidase (GPX) activity was measured as nmol of guaiacol mg−1protein min−1 (Chance and Maehly, 1955). Poplar and willow of each area were divided into two sections (root and above ground biomass), carefully washed with deionized water. Total content of Arsenic, Cadmium, Lead, and Zinc in plant extracts were determined by an ICP-OES according to the USEPA method (USEPA, 1995a,b). Bioconcentration Factor (BCF) and Translocation Factor (TF) were determinate for each contaminants. BCF was definite as the ratio of metal concentration in roots to that in the soil (Guarino and Sciarrillo, 2017); (TF) was defined as the ratio of element concentrations in the shoots to that in the roots (Guarino and Sciarrillo, 2017). Growth performance was estimated by measuring plant height (cm) and diameter (cm) and number of shoots (n°). The accuracy of the analytical procedure adopted for ICP-OES analysis was checked by running standard solutions every 20 samples. Yttrium was used as the internal standard. A reagent blank and certified reference material (NIST SRM® 2710 a Montana soil and NIST SRM® 1573 tomato leaves, for soils and plants, respectively) were included for quality control of analysis. The Dixon's test was used to test the presence of outliers in the dataset. A test of normal distribution and homogeneity of variance was performed in order to choose the proper statistical tools. The assumption of normality underlying ANOVA was violated by several variables so non-parametric tests were used. Differences between groups were first tested using Tukey tests. A significant difference was considered at level of P < 0.05. 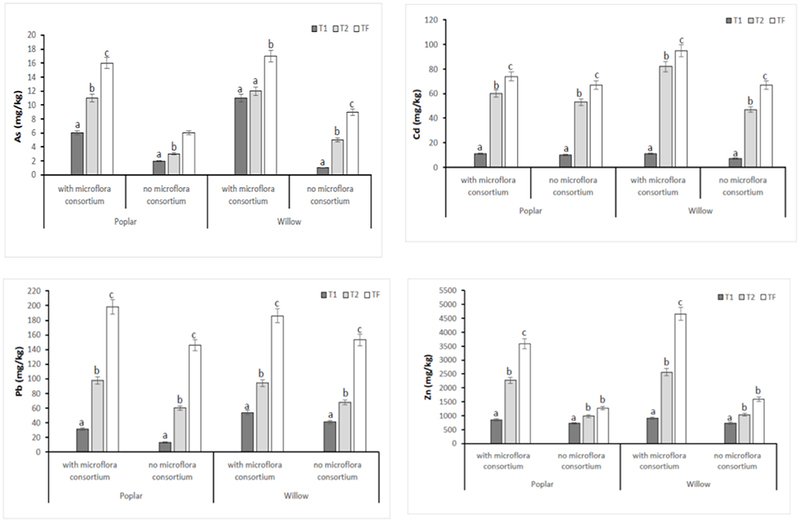 The total concentrations of HMs (As, Cd, Pb, and Zn) in soil with and without microflora consortium at different monitoring time were presented in Figure 2. The total contents of HMs in soil with and without microflora consortium of all four areas at T0 (Control) were: Zn (25,639 ± 354 mg kg−1), Pb (10,463 ± 220 mg kg−1), Cd (315 ± 62 mg kg−1) and As (201 ± 25 mg kg−1). After 12 months (T1), the concentrations of HMs were significantly (p < 0.05) decrease in soil with consortium [(poplar: Zn (23,866 ± 214 mg kg−1), Pb (9,321 ± 124 mg kg−1), Cd (279 ± 42 mg kg−1), and As (160 ± 14 mg kg−1); willow: Zn (21,340 ± 194 mg kg−1), Pb (9,001 ± 110 mg kg−1), Cd (258 ± 38 mg kg−1), and As (150 ± 12 mg kg−1)] (Figure 2). After 36 months (Tf), the results showed that metal concentrations in soil treated with inoculum were significantly less than in control (T0) [(poplar: Zn (17,675 ± 114 mg kg−1), Pb (6,004 ± 95 mg kg−1), Cd (203 ± 22 mgkg−1), and As (120 ± 10 mg kg−1); willow: Zn (17,987 ± 124 mg kg−1), Pb (6,523 ± 110 mg kg−1), Cd (198 ± 27 mg kg−1), and As (108 ± 10 mg kg−1)] (Figure 2). Figure 2. 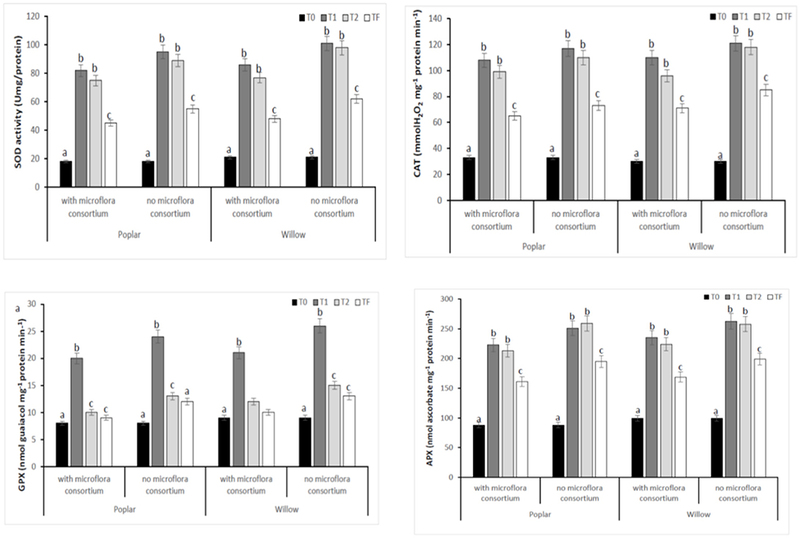 Total concentration of HMs (As, Cd, Pb, and Zn) in rhizosphere soil at different monitoring time (T0:0, T1:12, T2:24 and TF: 36 months) with microflora consortium and no microflora consortium in hybrid poplar Populous deltoids × Populous nigra and in willow Salix purpurea subsp. lambertiana. Mean values ± SE. The removal rate (%) of the HMs after the phytoremediation process applied in the SIN in the 3 years showed a high percentage of reductions (Figure 3). Our results that the highest reduction of HMs is present in soil inoculate by microflora consortium with the following order: As>Cd>Pb>Zn. S. purpurea highlighted great efficiency in a very significant way, for As (46%) but also for other metals (Cd: 37%, Pb: 29%, and Zn: 29%) while, the poplar for Pb (37%), Cd (35%), As (35%), and Zn (33%) were found (Figure 3). Figure 3. The removal rate of in soil HMs (As,Cd, Pb, and Zn) (%) afeter 36 months (Tf). Values represent mean ± SE. In all poplar and willow, the evident symptoms of phytotoxicity by heavy metals as necrotic areas on leaves, leaf chlorosis and reduced leaf area were not present. Therefore, the Height plant, Trunk diameter and Number of shoots were not affected by heavy metal concentration in soil and different treating time (0, 12, 24, 36 months); while they were influenced by the presence of rhizosphere microorganisms as shown in Figure 4. The poplar height after 36 months with microflora consortium resulted in significant increase (492 ± 0.05 cm, p < 0.05) in comparison with poplar without microflora consortium (301 ± 0.02 cm). 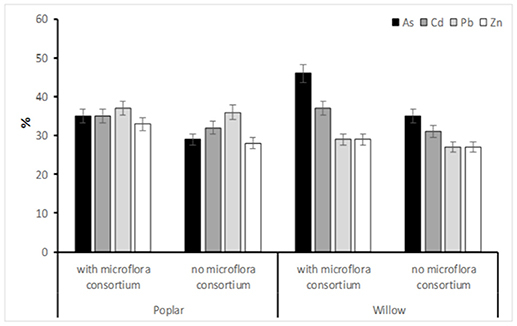 The trunk diameter increased in poplar microflora consortium (18.6 ± 0.05cm) against without microflora (7.0 ± 0.04 cm) (Figure 4). For willow, the increase of growth was similar to poplar; the height willow after Tf with microflora consortium resulted in significant increase (250 ± 0.04 cm, p < 0.05) in comparison with poplar no microflora consortium (150 ± 0.05 cm). The number of shoots increased in willow with microflora (18 ± 0.05) in relation to the willow without microflora (13 ± 0.04) (Figure 4). The increase of willow and poplar organs indicates that Salicaceae could develop in heavy metal environments (Kubátová et al., 2016; Redovniković et al., 2017). Metals and metalloids levels in shoots and roots collected from the contaminated four areas are presented in Figures 5, 6. The concentration in roots for all metals was usually higher than in aerial parts. This trend was evident particularly for Pb. In poplar and willow treated with rhizosphere microorganisms, the Pb concentration in roots was five times higher than in leaf and stem (poplar root: 1,846 ± 121 mg kg−1; poplar leaf: 198 ± 11 mg kg−1; willow root: 1,863 ± 114 mg kg−1; willow leaf: 186 ± 15 mg kg−1), indicating their poor translocation in aerial parts (Figure 5). This distribution of Pb was in accordance with other studies (Zaier et al., 2010; Fahr et al., 2013; Vurukonda et al., 2016). Concerning the other metals (Cd and As) the mechanism is similar, suggesting a little translocation from roots to leaves and a longer time of adaptation to contaminated soil activated a tolerance mechanism. The only exception was Zn The only exception is Zn, whose concentration in aerial parts varied from 3,595 ± 56 mg kg−1 (poplar with microflora) to 1,279 ± 42 mg kg−1 (poplar without microflora), and from 4,656 ± 89 mg kg−1 (willow with microflora) to 1,588 ± 36 mg kg−1 (willow without microflora), respectively (Figures 5, 6). To evaluate phytoextraction performance of Salicaceae, BCF and TF were considered at the end of the experiment (Figure 7). 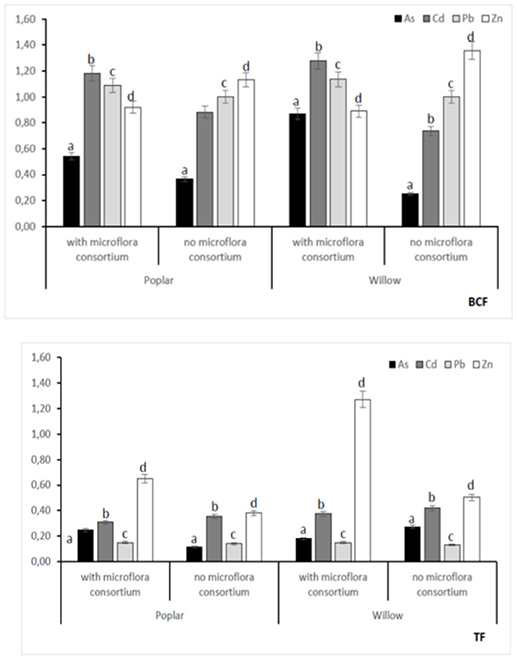 BCF values for all metals in poplar without microflora were lower than 1.0; while, in poplar with microflora BCFCd (1.18), BCFPb (1.50), and BCFZn (1.27) were higher than 1.0 except for As (BCFAs 0.54). These data are in agreement with other studies (Algreen et al., 2014; Redovniković et al., 2017), in which the value of BCFCd was better than 1.0 and it was dependent on Cd concentration in the soil. In the willow, the trends of BCF are similar to those of poplar even if their values are higher, in willow with microflora the values of BCF are: BCFAs (0.87), BCFCd (1.28), BCFPb (2.22), and BCFZn (1.73); while, the values of BCF in willow without microflora are lower than 1.0 except BCFPb (1.03) and BCFZn (1.40) (Figure 7). 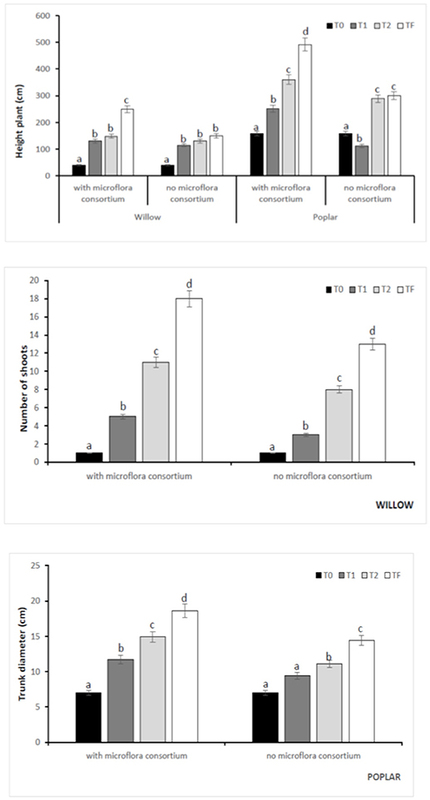 However, all TF values were minor than 1.0 both poplar and willow except for TF value of Zn (TFZn 1.27) in willow with microflora (Figure 7).These results indicate that the Salicaceae in particular, poplar and willow primarily accumulate heavy metal in their roots; therefore, they could be good candidates for phytostabilization processes in highly contaminated soil. Our results, then, demonstrate that it is difficult to translocate heavy metals (As, Cd, Pb, and Zn) to the aerial organs of Salicaceae. Figure 4. Kinetics of the biometric parameters at different monitoring time (T0:0, T1:12, T2:24, and TF: 36 months) with microflora consortium and no microflora consortium in hybrid poplar Populous deltoids × Populous nigra and in willow Salix purpurea subsp. lambertiana. Mean values ± SE. Figure 5. Total concentration of HMs (As, Cd, Pb, and Zn) in areal part (shoots and leaves) at different monitoring time (T0:0, T1:12, T2:24 and TF: 36 months) with microflora consortium and no microflora consortium in hybrid poplar Populous deltoids × Populous nigra and in willow Salix purpurea subsp. lambertiana. Mean values ± SE. Figure 6. 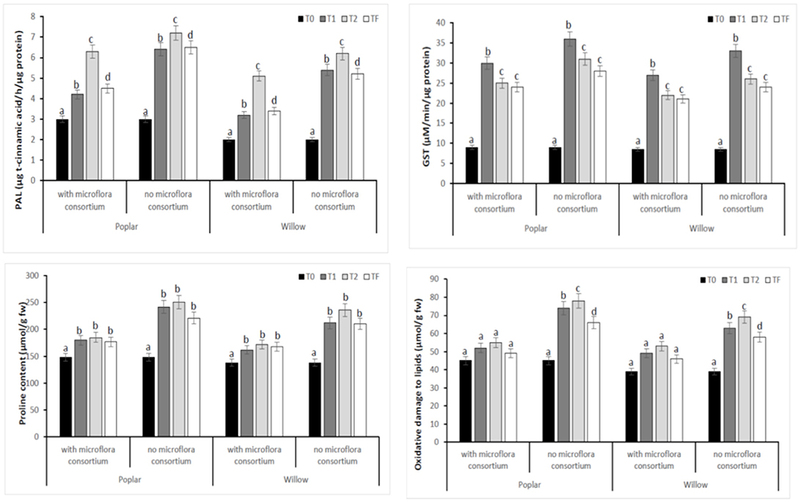 Total concentration of HMs (As, Cd, Pb, and Zn) in roots at different monitoring time (T0:0, T1:12, T2:24, and TF: 36 months) with microflora consortium and no microflora consortium in hybrid poplar Populous deltoids × Populous nigra and in willow Salix purpurea subsp. lambertiana. Mean values ± SE. Figure 7. 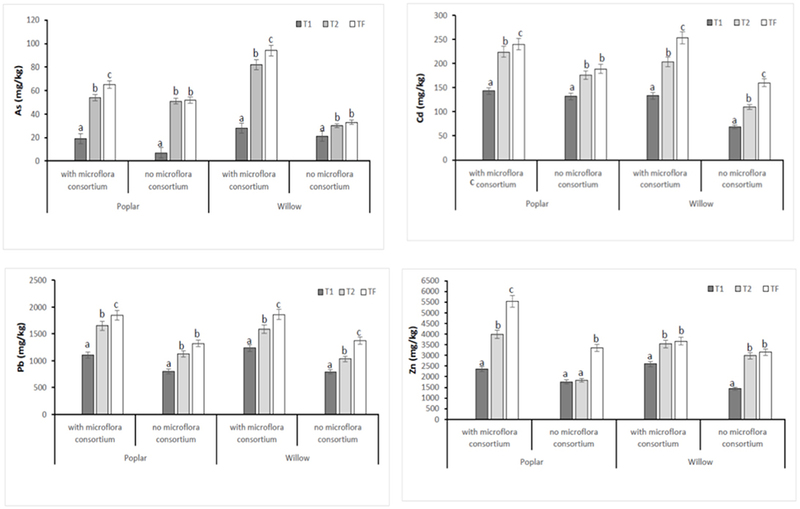 Bioconcentraion factor (BCF) and Translocation factor (TF) at 36 months with microflora consortium and no microflora consortium in hybrid Populous deltoids × Populous nigra and in willow Salix purpurea subsp. lambertiana. Mean values ± SE. To estimate the defense mechanisms against oxidative damage that are activated during stress to regulate toxic levels of Reactive Oxygen Species (ROS), the antioxidant enzyme activity were determined in leaves of poplar and willow with and without rhizosphere microflora, during the different exposure time (Figure 8). 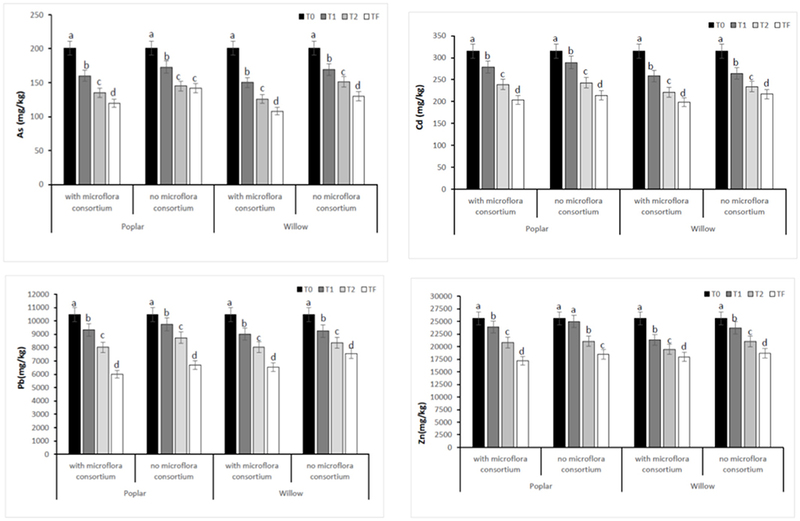 Our results showed that rhizosphere microorganisms and exposure time to different treatments influence activities of the antioxidative enzymes. The activity of SOD in both Salicaceae at T1 and T2 increased significantly (p < 0.05) in plants without rhizosphere microorganism in comparison to the plants with microorganisms (Figure 8). The highest SOD activity in leaves of poplar and willow without microflora at T1 and T2 could be a better response for plants to defend themselves from induced oxidative damage that heavy metal exposure in absence of microorganism that instead promote the growth of the plants. CAT, GPX, and APX activities in leaves of Salicaceae showed similar arrays to SOD activity and increased in T1 and T2 treatments in relation to the control (T0) (Figure 8). The amount of oxidative stress (MDA content GST, PAL, Proline content) showed in Figure 9. A higher level of MDA content in the leaves of Salicaceae non-inoculated in response to heavy metals was observed. At the end of experiment (Tf 36 months), no significant difference between control (T0) and treatments in MDA content in leaves of both Salicaceae was found. These results were in accordance with other studies where the increase of MDA content during T1 and T2 suggests strong internal detoxification process inside plant cell, while the decrease of MDA content during Tf indicated that the plants required some period to tolerate the contamination of heavy metals and therefore respond to activate the antioxidative defense system against higher levels of ROS (Guo et al., 2015). Figure 8. Enzymatic activities of SOD, CAT, GPX, and APX in leaves of hybrid poplar populous deltoids × Populous nigra and willow Salix purpurea subsp. lambertiana at different monitoring time (T0:0, T1:12, T2:24, and TF: 36 months) with microflora consortium and no microflora consortium. Mean values ± SE. Figure 9. Enzymatic activities of PAL, GST, Proline, and MDA in leaves of hybrid poplar Populous deltoids × Populous nigra and willow Salix purpurea subsp. lambertiana at different monitoring time (T0:0, T1:12, T2:24, and TF: 36 months) with microflora consortium and no microflora consortium. Mean values ± SE. Populus and Salix are two genera of the Salicaceae family that can be used for phytoremediation technologies. The genetic diversity associated with rapid growth and peculiar physiological and biochemical characteristics are important requirements for the selection of genotypes useful for phytoremediation (Pulford and Watson, 2003). The choice of Populus and Salix clones seemed appropriate to us considering the biophysicochemical characteristics of the soil and the environmental ones. The use of microbial consortium specialized species such as growth promoters (PGPR) was extremely effective given the obtained results of HMs removal. The percentages of removal demonstrated that the biological system (plant-microorganisms) applied in the field shows extremely interesting data for all heavy metals present in soil. The optimization of the plant-microorganism system referred to the stational conditions allow the system to work synergistically by mutating both biological and adaptive benefits. HMs enter the plant through the roots via symplastic and apoplastic mechanism. The root cells are the first barrier of entry of HMs into the roots, as the chemical structure of the cell walls of the roots (in particular, cellulose and pectin) constitute the first entrance barrier. After overcoming the HMs wall barriers, they been exposed to the plasma membrane and enter the cytoplasm through the membrane transporters that are involved in the transport of nutrients. In accordance with our results, the enzymatic activity of SOD, CAT, APX and GPX in Salix and Poplar of our experimental design outlines a strong tendency to adapt to stress HMs during the time of exposure, at the time T2 we begin to notice a lowering of the enzymatic levels that denotes a new trend of homeostatic level. Monitoring of these enzymes is essential for the eco-physiological evaluation of the plant and the resulting fitness. The detoxification of inorganic pollutants generally takes place through several stages that involve innumerable chemical transformations and the intervention of various enzymes. Increasing the expression of GSTs contributes to xenobiotic stress tolerance. GSTs are expressed predominantly in the cytosol, and they are involved in detoxification, through the conjugation with GSH, of various xenobiotic (Scarponi, 2005). The analysis of PAL suggested that the enrichment of PAL activity could be associated to excessive HMs stress and they fade over time. The overproduction levels of MDA is an important symptom of plant adaptation produced rapidly following stress from HMs. In the same way, Proline expression levels are also related to the amount of ROS to be detoxified. Our data in the field with wood species (Poplar and Salix) confirm the crucial role of detoxification mechanisms starting from ROS in the various cell sectors. In reference to what we can define ROS network, it is possible to demonstrate from the data shown how the plant in the short, medium and long term tends to reach a new equilibrium that allows the maximum possible efficiency in the processes of phytoremediation (Mittler, 2017). There is affirmative association among root colonization by arbuscular mycorrhizal fungi and soil concentration of Zn, Cd, Pb, and As (Leung et al., 2010; Jia et al., 2014). Many references indicate how AM fungi are convoluted in the expression of some genes in plants when they are prone to stress from HMs. The hyphae of G. intraradices when there is pollution from Zn emit signals Zn in the production of GST as a Zn transporter (Hildebrandt et al., 2006, 2007). G. mosseae hyphae colonization shows a rise in plant development and Pb uptake in the root and then in the stems (Rajkumar et al., 2009). The co-inoculation of soil microbes with AM species may also be right if that the mixture of soil microbes is selected being active under stress (Miransari, 2010, 2011). Soil microbes can have an effect by helping the plant grow in symbiotic and non-symbiotic relationships. Therefore, the existence of microbes in the plant's rhizosphere can increase the processes of phytoremediation involved a greater interaction between plant-microorganism, as absorption and transport of HMs and mechanisms of tolerance in the plant through their compartmentalization and biotransformation. Moreover, because of this inoculation, a high production of growth regulators and a greater capacity to absorb water and nutrients was predicted. The quantity of IAA released by endophyte bacteria is important in modulating the plant-endophyte association and plant development in metal polluted soil (Shin et al., 2012). Other studies have correlated the activity of endophytic bacteria to the modulation of the antioxidant enzymatic activity demonstrating the implementation of defense mechanisms toward stress by HMs (Zhang et al., 2014). In addition, endophytic bacteria such as Pseudomonas can also use methylation and detoxification mechanisms. Bacteria have a great potential to improve the solubility of metals and minerals from the ground by concealing low molecular weight molecules such as siderophores. This biological network allows a greater availability of nutrients and an increase in the uptake of HMs of the plant. These data confirm previous observations of the role of microbial populations on multi-contaminated soil, supporting growth of the accumulating biomass. Encouraging connections happening in the plant-microbe system developed plant resistance, and uptake potential of As, Cd, Pb, Zn, which may be opportunely exploited to increase the phytoremediation of environmental contamination. The right association between plant and bacterial consortium is fundamental for the success in the field of these experiments and therefore consequently for the subsequent reclamation works. Knowing how to associate morpho-functional characteristics of plants and biological manifestations of the consortium are fundamental but even more important is the transfer of this biological system to the characteristics of the soil and the environmental conditions. The customization of these biological systems to the conditions of phytoremediation makes an assisted dynamic model that is very interesting for the future. In fact, these models, if well-applied to the reality of the site and well-organized in the choices offer a potential that has not yet been fully explored. Our experimentation is an organic and dynamic model of these perspectives. CG has designed the experiments. BP has collected the samples. RS has done the analyses. Scarponi, L. (2005). “La metabolizzazione dei fitofarmaci nei vegetali,” in Biochimica Agraria (Scarponi) (Bologna: Pàtron Editore) 987–1011. USEPA (1995a). EPA Method 3051: Microwave Assisted Acid Digestion of Sediments, Sludges, Soils, and Oils. Test Methods for Evaluating Solid Waste, 3rd Edn. Washington, DC. USEPA (1995b). EPA Method 3052: Microwave Assisted Acid Digestion of Siliceous and Organically Based Matrices. Test Methods for Evaluating Solid Waste, 3rd Edn. Washington, DC. Copyright © 2018 Guarino, Paura and Sciarrillo. This is an open-access article distributed under the terms of the Creative Commons Attribution License (CC BY). The use, distribution or reproduction in other forums is permitted, provided the original author(s) and the copyright owner(s) are credited and that the original publication in this journal is cited, in accordance with accepted academic practice. No use, distribution or reproduction is permitted which does not comply with these terms.